…those aren’t your only options! We plan on being somewhere in the middle for sure. I definitely don’t agree with the American Academy of Pediatric’s recommended vaccine schedule. It’s just too many, too fast. (There are currently 12 Vaccines on the Standard Childhood Schedule, as opposed to I believe 4 when we were babies.) I also don’t feel that not vaccinating is the route for us – I think that vaccines were created for a reason, and that diseases like polio and TB have almost been eradicated in our county thanks to mass vaccinations. Should you give your baby this vaccine? The book is highly informative, and his final chapter (entitled “What Should You Now Do?”) breaks parents down into three groups, and I’d say I’m pretty solidly in the third group. You believe that all the diseases are a threat, but you worry that some of the potential problems with vaccines haven’t been thoroughly researched to your satisfaction. You want to vaccinate, but you want to do so in a way that minimizes each potential risk (whether or not the risk is real). 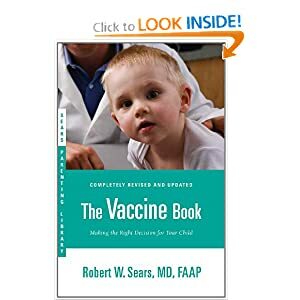 This group used to be somewhat smaller, but it has been growing in recent years as the media and the Internet bring theoretical problems with vaccines to light. Your biggest challenge is that your baby is young, you need to start vaccinating, but you just aren’t sure what to do. I’d definitely say that describes me to a T. My Mom told me that when I was a baby, I had a scary, severe reaction to my first round of shots (which included MMR) – we’re talking 105 degree temp if I remember right, so after that, Mom spaced out all of her kid’s shots to one at a time. That just makes more sense to me. Because of that, I’ll probably be following Dr. Sears’ Alternative Vaccination Plan pretty closely. It allows you to minimize the amount of aluminum your baby is exposed to at a time, only gives a maximum of two shots at a time (in case of reactions, it’s easier to figure out what your baby reacted to, plus it allows their little bodies to process each vaccine more individually), it starts out with the diseases that are the biggest threat to infants, and it delays those that are fairly mild for infants/that they’re highly unlikely to catch as infants.We have already skipped the recommended HepB at birth and 1 month (I tested negative for it and nobody we are close with is a carrier, and since it’s an STD we weren’t worried about Stella contracting it as a baby!). We’ll integrate that shot later. The “standard” thing to do at two months is a massive amount of shots, in my opinion. HIB, Pc, DTaP, Rotavirus, and Polio. No way, no how were we going to give that many vaccines at once, so today we started with just the DTaP and Rotavirus vaccines. 11#13oz and 23″ long today! DTaP is a shot in the thigh, and we decided to do this one right away because pertussis (whooping cough) is so dangerous for infants. Since we just diagnosed a case in my office last week, this was high on the priority list to get done right away. Poor Stella did NOT like this shot – I had to hold her arms down and try to talk to her and keep her calm, but her little face screwed up tight, she turned bright red, and then she took a deep breath, SCREAMED, and cried. Poor thing. 😦 It took everything in me to not cry myself. I popped her on my breast right away afterwards, and once she settled down enough to latch, the nursing definitely helped to calm her down. Biggest mistake I made today – I forgot to buy the damn infant tylenol BEFORE her appointment, so instead of being able to giver her a dose just before the shots, I had to drive a crying baby with a sore leg to Target to pick some up and give her a dose 30 minutes later. Oops. 😦 I will not make that mistake again! Poor baby took a three hour nap this afternoon (as opposed to her normal 45 minutes snoozes). I hope her leg is feeling better by tomorrow. As for the other standard two month shots, we are going to follow the plan I linked to above, delay polio until 9months, and do the Pc and HIB on the alternating months. Since I work in a medical office, it should be pretty easy to get her in at 3, 5, and 7 months for those shots, as it just requires a quick nurse visit. I know it’s pricking her more times, but I honestly feel like it’s a much safer alternative to doing 5 at once, and I’ll have the tylenol ready next time! My two cents, as an immunologist, is that seems bizarre that the standard regimen is to vaccinate this early. Vaccination works by providing molecules which will select B cells of the adaptive immune system. My beef is, at 2 months, the b cell pool which begins to form after birth, is barely respectable. you'd probably have a much better response, if you vaccinated later, say at 3-4 months. That is what I plan anyway.Good call on staggering the vaccines, shocking a baby's system with that massive dose of vaccines seems like asking for trouble, and in the rare case, you get it. I'd definitely go with a staggered schedule, as well.Sorry for the many Typos, posting from my phone. we delayed vaccines too. I didn't do a lot of research beforehand, I just went with momma instinct. I wish I had known that about the hep vaccine, or I would have waited on that one too. If he is scheduled to get a combo vaccine (more than one vaccine in one shot), that's all he gets for a few months. I def. got the pertussis one, especially since my mom was staying with us and she ended up getting pertussis a few months later. I'm especially worried because I have a boy and autism is higher in boys (i know they disproved the link, but I still worry). The way I figure it, kids are getting way overloaded just because the vaccine companies make the rules and influence the legislation and doctors. You don't know who to trust. A lot of research is funded by the very people that make the money off of the vaccines 😦 Kudos to you for being safe and smart about her vaccines! Thank you for this! I was always so uncomfortable w giving my first son so many vaccines to the point where we purposely delayed checkups to space them out a bit…tylenol is a must! weirdly enough my first son never had any reactions (negative or positive) to the shots, but I am prepared for the second one. I feel tylenol is a MUST in the house in case a fever pops up! We made the rookie mistake of forgetting the baby Tylenol the first time too! We felt bad about that one! But, we haven't made that mistake again! :-)I'm really so impressed with how much you research every thing. I think I told you before but I wish you had your kids first so I could have learned from you! 🙂 Stella is a lucky little girl! I will be buying that book for sure. I agree with you I am somewhere in the middle and right now plan to break up the shots and not have so many all at once. Thanks for sharing! That part of the book describes me too. I want to leave out the Hep B and any flu shots. I think we'll start at 6 mos and I just need to talk to the pedi about how we can spread them out a little more (finally found someone who will take us, which is also crazy that we had to search so hard). Too many, too soon! I'm wondering if there are any pedi offices that might use a little numbing cream to lessen the sting? Just a thought. Thanks for sharing your plan! I have got to work on this asap! We will be doing a VERY delayed schedule as well. Thanks for all the info. I couldn't agree with you more! thanks for all this info, it is very helpful and i must get that book. Good to know!!! Love this. I don't want all those shots at once for her at 2 mo and now I can ask questions. Just curious, what does Dr. Sears say about aluminum in vaccines? A friend posted a "OMG look how much Al is in vaccines" fearmongering post on FB – when I did a little research on it I found info suggesting there is much more aluminum that is received through what they eat… but I'm curious as to whether he had anything to say about it? Thanks Josey! We still haven’t done any vaccines but I know we will need to at some point. I just ordered the book to help me with a schedule. Ya, I’ll have to do an updated post on this. We’ve partly followed Dr. Sears’ delayed schedule, and partly just done our own thing – all with the blessing of our peds doc (I love her! ).